The morning after we arrived we rented bicycles from the hotel for 200 yen an hour. We went to the left on the bike path along the lake about a mile, then reversed course and went to the right across the bridge in the picture and along the other side of the lake. By the time we got back it had been about two and a half hours. It was delightful. There is nothing quite like biking along a good bike path, out of traffic, and in a beautiful area. 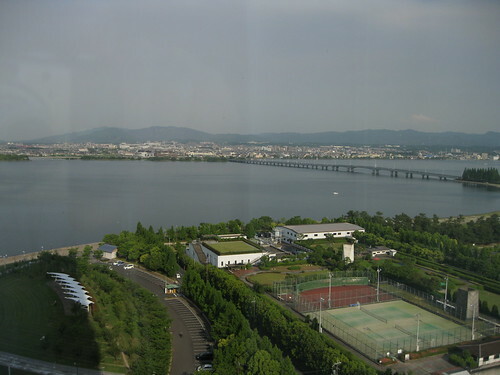 The Otsu Prince Hotel is mostly frequented by Japanese tour groups visiting the lake. Our room was designed for two, but had two long long couches and a table for people to sit and drink and talk. It is a resort hotel more than a business hotel. There was no internet access, at least in our room. I chose this hotel after considering many others. There are many ryokan in the area, traditional Japanese inns that offer Japanese style rooms, elaborate meals, and lots of ambiance. Ryokan also tend to be very expensive. I finally decided that we needed a Western-style hotel. Prince hotels are part of a large chain, originally associated with the Imperial family. The service was good, although not quite equal to the Keio Plaza in Shinjuku or the Kyoto Granvia. The Otsu Prince has a free shuttle bus that runs from Otsu Station to the hotel. This is very convenient. At this point in the trip we just wanted to relax. We biked, walked, and looked at the lake. We didn’t go to any temples, shrines, museums, or on any site-seeing boats. To tell the truth, there wasn’t much of interest in this line. Still, it was a nice place to relax. After two nights, we went back to Kyoto Station, and took the shinkansen back to Shin-Yokohama. We reunited with our family in Japan and had a very nice Italian dinner near Kannai in Yokohama, complete with an amazing magic show. The next day, we were on our way home.